The road to recovery is never easy. Speed bumps, detours, and U-turns are rather commonplace and often necessary in order to appreciate the full scope of sobriety. And while these challenges certainly serve a greater purpose, it never hurts turning to outside sources for strength, motivation, and perseverance. 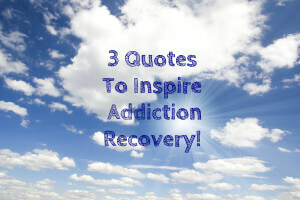 In this entry we have selected some of our favorite quotes from spiritual counseling recovery and quotes about addiction recovery to help you in your travels. Continuing with the “road” and “journey” theme, this quote reminds us that the trials we face in recovery are only momentary occurrences in a timeless adventure. Regardless of how hard you fall, the important part is picking yourself back up. By making mistakes, we learn how best to handle recurring situations; whether through avoidance or addressing them head-on. Over time, we learn to recognize these potholes well in advance, and deal with them in a proper manner. Giving up is perhaps the easiest thing you can do in recovery. In our spiritual counseling program, patients are provided with the tools and education needed to regain a foothold in the outside world. If you find yourself at a low point, it’s important not to beat yourself up. Many people can dig themselves a hole without even realizing it. In order to move upward, clients must first accept their current position before attempting the climb. By recognizing the decisions and behaviors that have contributed to the decline, you will be better able to avoid similar pitfalls in the future. Addiction treatment programs will teach you how to do this. There is no helping it: Addiction will get the best of you some days. And though these occasions may not result in a full-scale relapse, they will test your resolve. Simply put, the toughest times are the most important… regardless of the goal. At The Dunes East Hampton, our counselors offer tips and support to help overcome these periods; reinforcing the recovery commitment while strengthening accountability. Sobriety is not convenient, nor is it easy. It is a full-time job… but the benefits are outstanding. Call Us Not To Start Your Journey To Healing, Happiness And Recovery! PreviousPrevious post:Fox News: Teen Binge Drinking – Rite Of Passage Or Deadly Choice?NextNext post:The Christian Science Monitor: Why Did The Lindsay Lohan Intervention Fail?